Israel has carried out a successful test of its Arrow missile, the defence ministry has said. The test took place as Iran celebrated the 28th anniversary of its Islamic revolution. Israeli public television called the test a “message to Iran”. 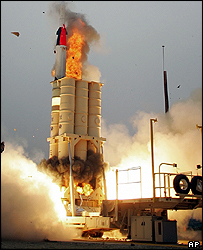 The anti-ballistic missile system was developed jointly with the United States after Israel came under attack by Iraqi Scud missiles during the first Gulf War.